Archer Queen is the best fighter among all archers because she got more Hit Points + More Damage + and the maximum firing range. When the Archer Queen altar is build Archer Queen will automatically spawned on your village for the cost of 40,000 Dark Elixir. Similar to the Barbarian King is once summoned she never dies (an Immortal) but if she's injured badly or fallen during battle then he needs to regain her health by sleeping for a period of time. How to Strategically Use Archer Queen to Win Clash of Clans Game? 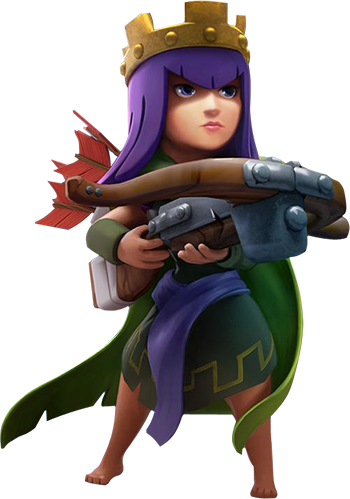 A good strategy to use her in a group with Giants like Barbarian King, PEKKAs, Golems and mixed with other archers, by using this way the giants will work as a protective shield while Archer queen and other archers file arrows to the enemies in range and weaken them before they reach the center of the group and specially against Air Units. With her new Royal Cloak Ability she can destroy one extra building for 50% almost immediately. Archer Queen is more effective in defense because she can Hit harder and attack faster, you can sue archer queen with barbarian king side by side to protect both ends of the village or use them on the same place to provide more protection on one location however the archer queen is better in defending your village then the barbarian king due to her range damage and her ability to attack air troops but when comparing to barbarian king she has lower Hit points. What is the cost to upgrade Archer Queen? Archer Queen has 45 Levels to be upgraded and after the initial cost of 40,000 Dark Elixir it costs 22,500 to 198,000 for each Level up and until level 14th it'll take 7 Days in Time for each upgrade and from Level 15 to 45b it'll always take 7 Days for the upgrade.